Meatloaf is one of the best homemade foods you have ever tasted. Some grew up with homemade meatloaf always serve on the table. There is no way you do not know what kind of food this is. In the market you can already avail many different brands of meatloaf, commercialize and full of preservatives which are very harmful to the body. One great way to have meatloaf, on your own table, the easy way, is to make and learn how you can make a regular meatloaf by yourself. Properly prepare all the ingredients that you have and make it a point the all the utensils are properly cleaned especially your hands. It is very important to think that hygiene is very important since you are cooking and you will use your hands in mixing the dry ingredients for a good result of the taste. Ready the oven and preheat with 350 degrees, the right temperature of the oven to get the best ever meatloaf. You need to unthaw the meat and put it at the side for a while. Hanging mixture by hand is very good since you can really mix all the ingredients properly and thoroughly. All the ingredients like the onion should be washed and cut properly if you are using a food processor you can put all the ingredients like the pepper, mustard, eggs, onions and milk. But if you want it by hand properly get a bowl and put is all together and mix properly with the use of your hand. There are other ways you can do so that you can mix all the ingredients by hand are with the use of cooking gloves so that you can still mix the ingredients by your hand. 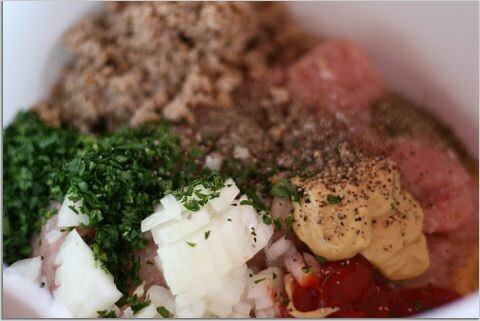 After combining it all, add the bread crumbs and all other seasoning to have a great taste of your meatloaf. After mixing it properly again, You can shape the mixture into the loaf pan. But before that you need to grease the pan with butter so that the loaf will not stick the pan. It is very important that you properly place the meatloaf and bake it for about an hour until it is well done. It is best serve when it is still hot.